If you have been reading for awhile or you know me personally then you know breakfast holds a special place in my culinary heart. So needless to say I was really excited to see the theme for this past week’s baking challenge was breakfast. I was even more excited when I was at Hy-Vee and I saw some adorable mini lemons -they were actually Meyer lemons on display. 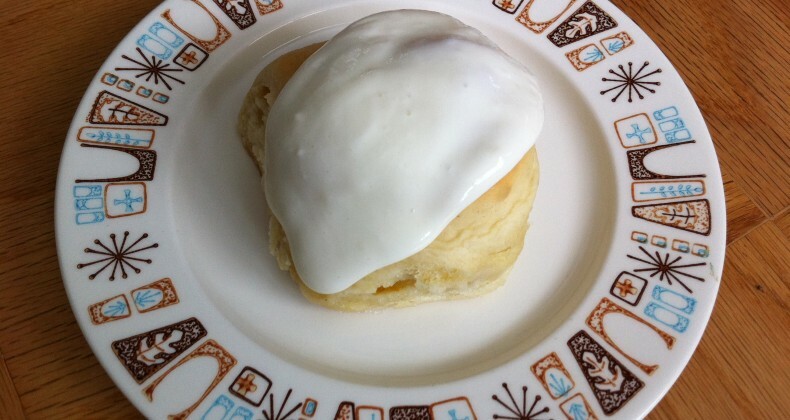 Ages ago I had bookmarked a recipe for Meyer lemon sweet rolls but couldn’t find them in the store. The rolls are soft and ever so slightly lemony. It pairs well the with sweet cream cheese frosting that I squeezed in some of the lemon juice for a nice tang. Even though we finally have some snow in Nebraska, I couldn’t help thinking about Spring while enjoying these rolls. If you don’t see Meyer lemons in your grocery store you could always use whatever citrus was available. Navel or blood oranges would be good! Are you a breakfast eater? What is your favorite breakfast food? Dump your yeast into the bowl of your mixer. While your mixer is running on low add in the dry milk, 1/2 cup of sugar, and salt. Add 1/2 cup of softened butter to the mixture, as well as the egg. Slowly begin pour in the flour, one cup at a time. Add just enough flour to create a soft (but not sticky dough). Let the mixer knead the dough for about 5 minutes until it becomes nice and elastic. Give it a spritz of oil over the top of the dough, place it in in a large, clean bowl, cover lightly with a damp towel, and let it rise in a warm place for one hour. My favorite place to let dough rise is in my oven with the light on. Once the dough has risen remove from oven and being preheating your oven to 375 degrees F.
Divide the dough into thirds. Use a rolling pin to spread the dough into a long, thin rectangle (about 1/2 inch thick). Melt the 1 cup of butter and spread approximately one-third of the melted butter over the long rectangle of dough. Sprinkle the zest of two lemons across the butter (you can sprinkle more for a lot of lemon flavor), then sprinkle 1/3 cup of sugar across the melted butter. Roll the dough up tightly, then slice into 1 1/2 inch rolls, and transfer to a large baking sheet lined with parchment paper. Repeat until all the dough has been used. Let the rolls to raise on top of your preheating oven for 20-30 minutes. Bake rolls in the oven for 16-18 minutes, or until the tops are a light, golden brown. Remove and frost immediately with Lemon Meyer Cream Cheese Icing. Beat together all of the fresh-squeezed juice from the lemons, cream cheese, and powdered sugar until very smooth. Spread over warm Lemon Meyer Sweet Rolls.